This is definitely one of my “back in time” or “nostalgia” records. I can remember my oldest brother bringing it home on 8-track (late ’79 or early ’80) and playing it in his POS ’76 Mustang. Just seeing the cover takes me back to a time when things were so much easier. We had just moved from the ‘burbs to a farm (which I was none too happy about) and I was about 10 years old. Dad had just retired from the NAVY a year before after 20 years of service. Everything was different. Dad was home more (which was great) and my brothers (6 and 8 years older than me) were getting into trouble all the time. What was a kid to do to escape a little? Music! For whatever reason over the last few days, the song I Can’t Tell You Why has been playing over and over in my head. I love that song and it’s quite possibly one of my favorite songs of all time, definitely my favorite Eagles song. In general I love this album but there are a few tracks that while I probably loved them as a kid, I can’t stand them now…Heartache Tonight, Those Shoes and The Greeks Don’t Want No Freaks. When the album is playing I always skip those 3. But then there’s the rest of the album…man, what an album. The title track, In The City (although I prefer the original version from The Warriors soundtrack a little more), I Can’t Tell You Why, Disco Strangler, King of Hollywood(!!! ), Teenage Jail and The Sad Cafe. All of these are such wonderfully written and performed songs. King of Hollywood definitely ranks highly for me all time as well. So dark and brooding. Love it. While I’m not the biggest Eagles fan in the world, I certainly would say this is their best effort. « What Happened To Bruce Dickinson? Their only purely rock album, isn’t it? Yeah, they didn’t do any of their country-ish stuff on here. I agree that this is their best album. 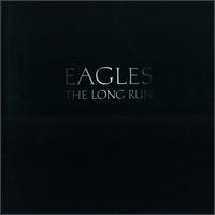 “Hotel California” is a classic in it’s own right, still “The Long Run” is some fabulous Hard Rock/Rock from The Eagles. I upgraded this album to CD about 6 years ago. The cover of this album is superb, with it being just black… a perfect example of “less is more” when it comes to album cover art. Back then, I found it strange that this album and AC/DC “Back In Black” were so similar in album cover design. Then… years later… Metallica comes out with another similar design style with their “Black” album cover. Warriors… come out and plaaaay… warriors… come out and plaaaaay! I actually like “Those Shoes” very much. It reminds me of Christmas… when I first received this album on vinyl. A true classic you have dusted off to reflect on!